Although many of the Kings in the Middle East are loved and revered by large portions of the citizenship, the recent democratic protests in Egypt will have far and deep reachings into nearby countries and economies. Egyptians have paved the way for more protesting by individuals and groups for the peaceful resolution to problems. They’ve proven they could overcome what many thought impossible. Cheers! 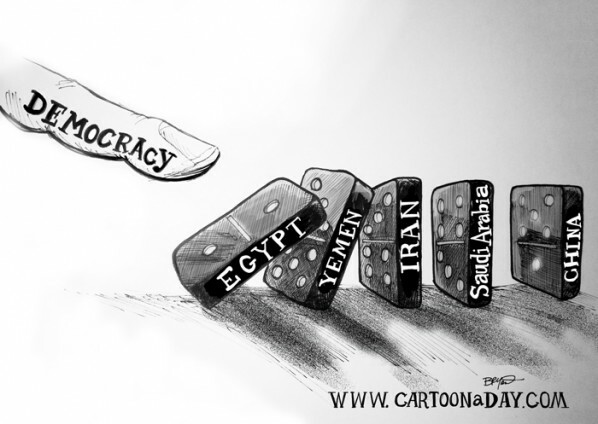 Inspiration: A funny political cartoon featuring Middle-Eastern countries described as dominoes. The Dominoes are falling under the influence of Democracy.